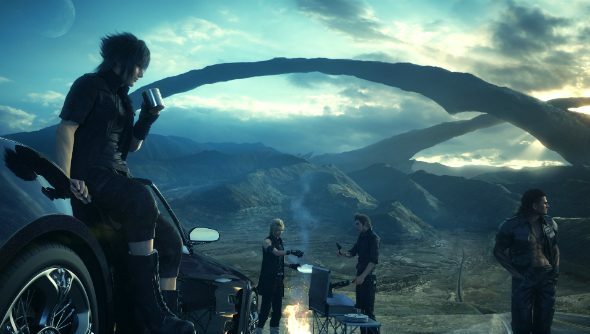 Final Fantasy XV director Hajime Tabata has said he is ‘quite positive’ about a PC version of the upcoming JRPG, and that it would not be a simple port of the console version. Need an RPG to tide you over until some more FFXV PC news arrives? Here are the best RPGs on PC. In an interview with French site JeuxVideo (translated via NovaCrystallis) Tabata said that the increased power of PC hardware excited him as a means to reintroduce features that were cut from the final release of the game due to console limitations. The PlayStation 4 and Xbox One versions are slated for a September release in the west, and Tabata expects to make an announcement about DLC plans later in the Summer. This continuing workload for the initial console release means a PC version could be more than a few months down the line, so don’t expect any late summer roadtrips with your ridiculously beautiful bro squad. We’d rather wait a while for a ‘far superior’ version of that one scene in the Jeep from Zoolander than the garden variety console port.